This is the short story of Little Hiawatha. Once upon a time, on a small island lived a young Indian boy. Hiawatha loved his boat and loved to take it into the river. He loved the currents and the waters. But above all, Hiawatha wanted to be a hunter. This boy had a sure foot and agile ears and eyes. He would stalk all kinds of animals, be it the deer, be it the deer. He had run after them, and try to catch them. All around little Hiawatha were animals of various kinds. His island had squirrels, porcupines, rabbits, deer, beavers, bears. You may also like to read, Pinocchio Story. Image Source–> intanibase.com. One day, a little Hiawatha set out to hunt, he found a rabbit and pulled out his bow and arrow. But before he could shoot the rabbit ran away and hid in his hole. The birds from tree tops laughed at poor Hiawatha. Hiawatha was about to leave when he saw strange footprints on the ground. So, he decided to follow them. He was on all fours as he crept, then suddenly he came face to face with a giant cricket. Giving out a yell he ran away. The mischievous rabbit who saw all of this laughed uncontrollably!.”Hiawatha is afraid of a cricket! Of puny little cricket”, laughed the rabbit. This made Hiawatha extremely angry. So, he chased the little rabbit driving it into a corner. Hiawatha pulled out his bow to shoot but couldn’t when he saw the rabbit cry. He lowered his bow and let the rabbit go. 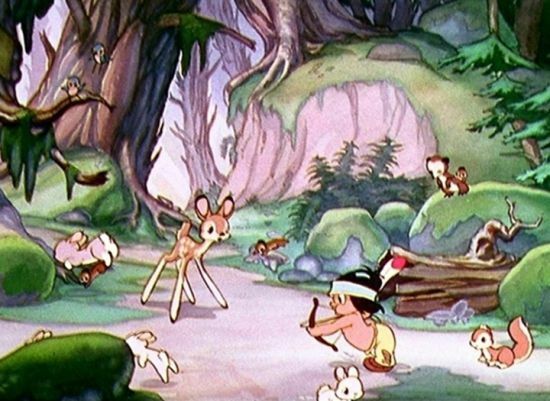 As soon as Hiawatha let the rabbit go, the rabbit was surrounded by his friends who were happy to see him. It was then, that Hiawatha decided he didn’t want to be a hunter anymore. “But this doesn’t mean I can’t explore and look for more animals”, he thought. So, he went around the island looking for animals to play with. Soon, he found a little bear cub hiding behind a rock. When Hiawatha approached the cub, the cub became frightened and ran away with Hiawatha in its tow. “I just want to play,” he called out, but the bear was too scared. The bear ran away into a dark cave, followed by Hiawatha. Hiawatha held the furry face in his hands and said, “I got you now. Let’s play”. But it wasn’t the cub Hiawatha held, it was the mother bear who roared in anger. She chased after Hiawatha. Poor Hiawatha only ran away. The beavers saw that Hiawatha was in danger, so they sounded the alarm. All throughout the island, the alarm could be heard and theTh animals came to help Hiawatha. Also, read The Jungle Book Story. Then the weasels set a trap, trapping the mother bear.But the mighty bear quickly broke free. Not sure what to do, but run little Hiawatha reached the riverbank. The friendly beavers helped him get in a trunk and shipped him away to the other side. But the bear followed Hiawatha everywhere he went. Hiawatha climbed a tree, so did she. In the end, Hiawatha jumped out of the tree. He was getting tired, seeing this the squirrels made a harness out of old tree branches. After hitching onto a deer they called out Hiawatha, “Here,” they screamed. “Jump onto this!” And he did exactly that! The helpful deer carried little Hiawatha safely to the other side of the island, too fast for the bear to keep up with. When they reached the shore, Hiawatha got off the harness and got in his boat. He was happy for he had made many friends. “Goodbye friends. I’ll be back soon to see you!” he promised as he rowed away smiling. You may also like to read, Alice In Wonderland. Basab Ghosh is the Content Specialist at Bedtimeshortstories.com. As an aspiring Author she loves to share her thoughts in the form of short stories, poems and more.